Nashville is one of 10 cities awarded the Choice Neighborhood Planning Grant by the U.S. Department of Housing and Urban Development (HUD). The $500,000 grant will fund a comprehensive neighborhood revitalization plan for the Napier Place and Sudekum Apartments housing developments. 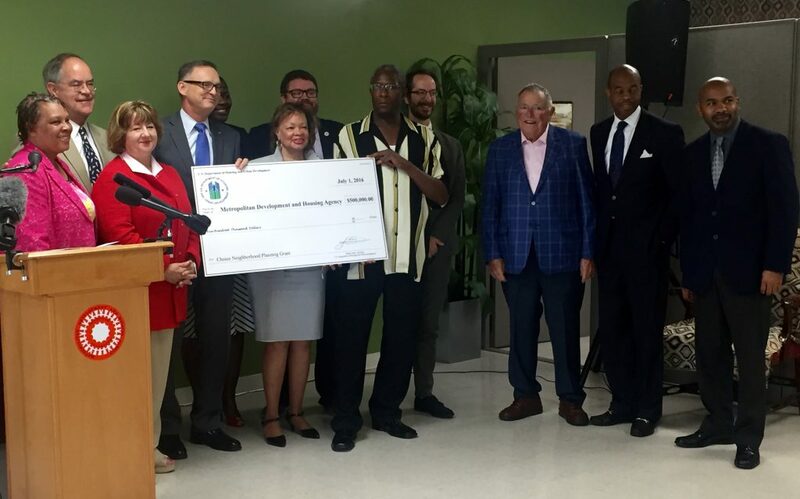 MDHA will use the grant to plan the revitalization of the two public housing developments based on HUD’s Rental Assistance Demonstration program. Choice Neighborhood planning focuses on three core goals: Housing, People and Neighborhoods. To achieve these goals, the plan will guide the Rental Assistance Demonstration resourced recapitalization of public housing apartments, while simultaneously leading the transformation of the surrounding neighborhood and improving opportunities for resident families. MDHA served as the lead grantee, with Martha O’Bryan Center as the co-grantee. Twelve key partners also played a role in the grant process: Family and Children’s Service, the Metro Public Health Department, Metropolitan Nashville Public Schools, Abigail Ministries Incorporated, Belmont University, Nashville Area Chamber of Commerce, Harvest Hands, Neighborhood Health, Napier Community Center, Trevecca Nazarene University, Wayne Reed Christian Child Care Center and the Metro Nashville Planning Department.